1. Never carry your pumpkin by the stem. It’s part of the visual allure, and if it snaps, it can accelerate the pumpkin’s rotting. Always carry the pumpkin from the bottom. 2. Store your uncut pumpkin in a cool, dry place. Once pumpkins ripen, they will deteriorate fast – heat and light speed up the process. 3. Wash the exterior of the pumpkin before carving. Use a solution of 1 gallon water and 1 teaspoon chlorine bleach. This will help prevent mold. 4. Draw your pattern on paper or use a pumpkin-carving template. This is easier and cleaner than drawing right on the pumpkin and makes revisions a snap. 5. To transfer a template to the pumpkin, enlarge it, cut it out and adhere it to the pumpkin with masking tape. Then either use pinpricks to mark the shapes and lines on the pumpkin or use a craft or utility knife and cut through the design to score it on the surface. 6. Don’t just think of face designs. Moons, stars, cats and witches are all fun and easy to do. You can even use a drill to make patterned light holes. 7. Consider buying a pumpkin-carving kit. Often they can be found for just a few dollars. Kits usually contain small scoops and serrated saws that aren’t commonly found in the typical toolbox. They’re great for detailed carving work. 8. When cutting out your shapes, always use a sawing motion. Go slowly and gently. A small serrated saw is best for the detail work. 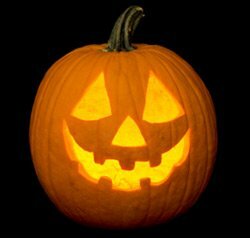 Never try to forcefully cut your pumpkin with a straight-edge razor – you’ll damage the pumpkin, hurt the knife and possibly cut yourself! 9. The more pumpkins in your display, the better. Four or five small pumpkins have much more visual impact than one large one. 10. If scraping out a pumpkin is too much hassle for you, consider buying a hollow acrylic or craft pumpkin. These are becoming increasingly popular, thanks to their realistic appearance and their ease in carving. Yes, you carve these soft plastic pumpkins just like a real one; most are made to be about 1/4 inch thick with inside colors that match a real pumpkin. And they last forever, meaning instant jack-o’-lanterns for next year!